After spending hours on downloading a large Zip file, it is painful if you find that it is corrupt. It happens many times if you are using slow internet connection. In this case, most of the people re-download the whole zip file. It is painful if you downloaded a large ZIP file which turn out to be corrupted. It takes time again and consumes data of your internet plan. To avoid this, try Zip2Fix. It is a nice utility that can extract undamaged files from damaged archive. 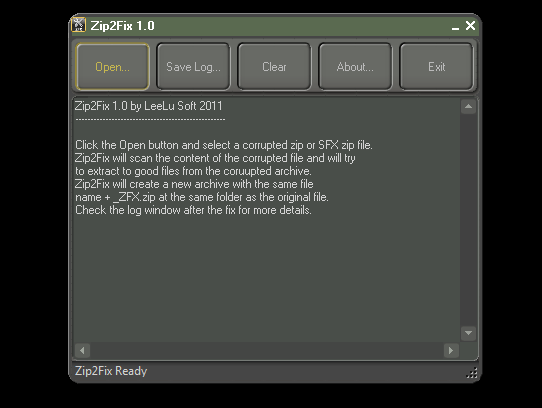 Zip2Fix is a lightweight software that is designed to extract undamaged files from zip and SFX archives. Good thing is that it is a portable tool. So, you can carry it with you in USB flash drives.As I already mentioned that it can only undamaged files, so never expect to get all files from the zip. Run the tool and browse the damaged zip file. Sorry, this tool does not support drag and drop for file uploading. And it will extract all undamaged files from this zip files. Application also keeps the log that contains information about extraction process, file name and size along with number of files extracted. Zip2Fix is a small but powerful tool that is able to extract undamaged files from ZIP and SFX archives quickly. So try to Extract Files from Damaged Archive with this tool. And don’t forget to share your thoughts about this tool with us via comments.